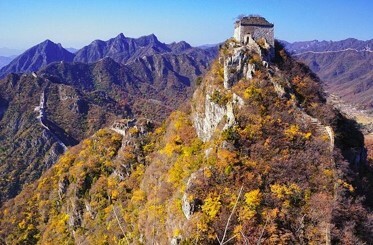 Jian Kou features steep mountains and beautiful scenery. "Jian kou“ can be loosely translated as "Arrow Nock" in English as the mountain is shaped like an arrow, with the collapsed ridge opening as its arrow nock. Visit famous spots, such as the "Nine-Eye Tower", "The Beijing Knot“, "The Sky Stair“ and "The eagle Fles Facing Upward“. You can also climb up to "Zhengbei Tower" to watch the sunrise an/or sunset. It takes 2.5h to get to Jian Kou from Beijing.